Edit: now give us our Order back. Also related is Rorate's post on their bad arithmetic. (Rome) The Apostolic Commissioner Father Fidenzio Volpi OFM Cap has published a correction. In it, he explains that the family of the religious founder of the Franciscan Friars of the Immaculate, Father Stefano Maria Manelli, has "absolutely nothing" to do with any possession or orders of transfer for the real estate of the Order. This had been maintained in recent months, according to which the the Order was placed under provisional commissioner, by the official Internet site of the Order www.immacolata.com. Father Alfonso Maria Bruno, who was appointed by Commissioner Volpi after the expulsion of the leadership of the Order, to name him as the most powerful man in the Order. The lawyer for the family Manelli had threatened criminal penalties, and requires clarification from Commissioner Volpi. This is now acknowledged that it was a libel, which was published by "someone" on the Internet platform. To date, no reasons for the provisional administration of the Order have been announced, because the openly published reasons: maintenance of the traditional rite, numerous vocations, critical examination of the Second Vatican Council, the development in the Church since then, the unabridged explanation of the faith, and strict observance of the rules of the order, are clearly not offenses. Instead, the claim was brought into the world from the environs of Father Alfonso Bruno, that Father Manelli had to overwrite the Order property to his family members and thus gave the impression that the superior had possibly stolen from his own religious order. Apart from the fact that the alleged transactions had taken place only after the beginning of the provisional administration, which gives more the impression of a mediated response, but could not be a reason for the provisional administration, it has now turned out to be slander, as Commissioner Volpi confirmed himself. 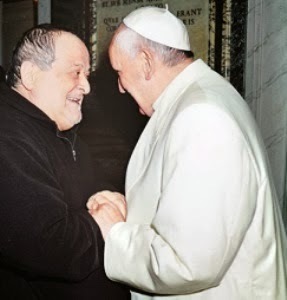 At the request of the prosecutor of the Manelli family, the false claim has now been deleted from the internet site of the Order managed by Father Alfonso Bruno. Instead, the complete correspondence between the Manelli family lawyer and Commissioner Volpi has been published at the request of Manelli family. so what happens now? a bit of internet slander has all but destroyed a thriving traditional apostolate. problem-reaction-solution. what do the volpis of the Church want to find a solution to? Traditional apostolates. create a problem - real estate dodging gossip on the net, reaction,'this needs judicial handling -solution, sweep away another traditional apostolate. there is a Faith V anti-faith(newnevangelisation) war going on in the Church. heads up people if this is how the game is played. reinstate in good order the franciscans of the immaculate immediately and let them get on with their work of being faithful to holy mother church! !philip johnson. And yet, the Legionaires of Christ and the NeoCats go merrily along as usual. Is "the complete correspondence between the Manelli family lawyer and Commissioner Volpi" online? Another lie that is being found out is the skewing of the numbers of those who wanted this sort of intervention. Rorate posted about this months ago and it is here again: http://pray4thefriars.wordpress.com/2014/01/31/just-21/ with the bottom line being :Out of a total of about 350 monks, 21 are a tiny minority, 6 per cent. Still to this day there are no proven or formal charges of heresy, crime, or schism!. The so called "internal conflict" was generated, cultivated, and maintained by a few and seemingly deliberately over the past few years. Some malcontents, not living their Marian Vow, influenced others and turned a number of hearts against their founding fathers. Machinations have been and are going on behind the scenes with sympathetic ears in the hierarchy who do not care for anything of the traditional aspects of the Holy Church, even those the faithful have a full right to. Reports of great suffering, even hunger, among the brothers is coming forward. Pray for the complete exoneration of the founders and a restoring of this holy Institute according to their direction and not the direction of a commissar or malcontents. A number of friars cannot in good conscience take the oath that the Novus Ordo is a 'traditional' expression of the Mass. It is not even though a valid liturgy. A number of friars are going home. The seminary is disbanded and holy vocations scattered. Thank you for your informative comment M. Prodigal. Yes, the "bad arithmetic" Rorate post shows how the numbers complaining inside the FFI were very small (6% as you say) and look at the havoc they have caused this traditional thriving Order! I wonder if this small percent now regret their action, or whether they were placed there for this very reason. The wiles and machinations of the Devil are unlimited. I could not in good conscience take an oath that states that the Novus Ordo is a "traditional expression of the Mass" either!! It would be a lie if I had to do that, so I fully sympathise with the Friars who could not do this. I do think it CAN BE a valid liturgy though, but only when celebrated with reverence by a holy priest who takes care of following the proper rubrics. So many do not. Can we have any hope that the FFI will be able to continue its good work now in peace and safe from any more nosing into their wonderful Order? Or is it tragically too late for that now - as you seem to infer - with the damage having already been done? Those who have trashed this Order on the blogosphere have a responsibility to make a public apology. If they don't they are guilty of slander, calumny, etc. Some who have read these allegations have taken them as true and it is likely that some will never revisit these sites to find out that these charges were false. That is the crime. This whole affair has been shabby from the beginning. The quicker the Franciscan Fathers of the Immaculate have restored to them the right to say the Vetus Ordo as and when they wish, and their congregation to hear it, as is their God-given right stemming from Quo Primum and confirmed in Summorum Pontificum, the better. It is all in Italian and the letters are images and therefore not susceptible to automatic translation. They are lengthy. So what does the Volpi case amount to now? Quasi-Lefebrvist traditionalism and "distortions" by the Sisters? I suspect the latter were something to do with the now discredited accusations regarding property but nothing specific to support these accusations has been disclosed so far. I would have thought that Father Volpi's rush to making groundless accusations of embezzlement is now sufficiently serious to put a big question mark over his suitability to continue in his role. Can we anticipate the Cardinal who appointed him clarifying the position? Indeed you are correct. Public apology for the public calumny. It is a sin and those who foamed at the mouth should make a deep examination of conscience as to why they became rabid. I think it'd be helpful if this article would..make rather more sense. I've generally understood the appointment of a commissioner to have been related in particular to concerns regarding possible abusive insistence on the traditional Mass; this article seems to be talking about something related to real estate. I'm having a tough time making a connection here. ..PS. I'm fairly suspicious about the claim regarding poor math. So far as I'm aware, even if NONE of the membership of a particular Order would request the pope even review their efforts, His Holiness certainly has the right, as pope, to intervene with the Order as he deems required. Our pope certainly would seem to be allowed to correct an Order if he felt the need. Another false accusation. I'm sorry you're having a hard time understanding the article, it's not hard, John. John: I think you need to start by reading Father Volpi's letter of 8th December. The question of the traditional mass seems to have been a red herring. The founder of the Order, Father Manelli, merely exhorted the order to use the Extraordinary Form at conventual masses. He did not mandate it and I do not think Father Volpi ever suggested he did. However in that same letter he accused the family of Father Manelli of embezzlement of the property of the Order - suggesting this might be a criminal act and certainly contrary to Canon Law. He has now had to totally retract that accusation. Father Volpi's remaining accusations are that the Order is too traditional and the Sisters have provided "distortions" to the male order. However no detail has been provided to support these accusations or to show that even if they are true that what the Order has done is anyway wrong or an offence. In the absence of such detail one wonders how such draconian measures as he has imposed can in any way be justified. Of course the Pope can intervene where he likes but the laity are entitled to seek explanations; I hope the Pope does intervene to put the matter right. For me the FFI are one of the bright hopes for the future of the Church. Thanks very much. That's an excellent summary. I know John and I've given up on him, but others certainly benefit from these explanations for sure. I know I do. There is no "right" to arbitrarily persecute a good, orthodox and thriving order, which ought to be held up as an example and antidote to all the orders involved in attacking Faith and morals. The persecution of the good is being pushed by many "within" the Church as without. Golly, what other lies might there be against the holy founders and the Institute? hmmm. False numbers, public and false accusations of embezzlement, etc. Where does it end? The intimidations and threats, the dispersing of the holy seminarians and holy priests....the gloating of the ones who have brought this and say others must acknowledge the commissar and the modernist oath...but the Truth has a way of coming out in time. It will here too. I wonder if it will happen before the passing of Fr. Manelli who is suffering much. And many brothers are suffering much--spiritually, emotionally, and some physically as hunger invades some friaries cut off from benefactors.